You've got to hand it to Hitachi: it's not easy to muster mass enthusiasm for external storage. So the LifeStudio hard drive line takes a new tack: piling on features until it doesn't feel like a hard drive anymore. The LifeStudio comes in a mobile and a desktop form (the former runs 250GB, 320GH, and 520GB; the latter 1TB or 2TB), and leverages the Cooliris platform for easy 3D navigation. That ease comes from the LifeStudio's automatic organization of your content by file type and date. It's more than you'll get from other hard drives, but knowing that the software is capable of that kind of automatic categorization makes wish there were more options—sort by name, for instance, or size. But that's a minor point, and one that will be addressed via software updates from Hitachi based on user feedback. LifeStudio also features social integration, meaning you can upload or view content on Facebook, Flickr, and Picasa, with more partners possible, again pending user interest. There's also premium content available, through Cooliris, in the form of CBS, Hulu, and more. It's hard to imagine, given how many avenues you have to access that sort of digital media, that you'd get there through your external hard drive. But even if you don't tap into it, it's nice that it's there (albeit ad-supported). You can also do local backup and online storage within one interface, and by switching a single button. For cloud storage, the first 3GB are free, while 250GB will cost $49/year. Requisite iPhone and iPad apps mean that you can access files from those devices, or from any browser. And as another fun first, LifeStudio Plus products feature an integrated USB key that starts comes with a 4GB microSD card and can be customized up to 32GB. There's currently only one key per drive, but in the future Life Studio is expected to support multiple keys. The UI is intuitive to the point that your parents could use it without a phone call, if your parents bothered backing up their files. Which is really the question here: will sexing up external hard drives be enough to bring technophobes into the fold? Hitachi's certainly making an earnest effort to find out, especially by not charging a premium for the software that brings LifeStudio to life (LifeStudio mobile starts $80 for 250GB; LifeStudio desk at $100 for 500GB). And since a software-based solution can be incrementally improved and tweaked along the way with download after download, there's no reason to think they won't attract a crowd at some point down the line. July 7, 2010 (San Jose, CA) – Meet the hard drive evolved: the Hitachi LifeStudio external hard drive family. During the last decade, external hard drives have offered little beyond design changes and simple storage and backup. With the new LifeStudio family, launched today by Hitachi Global Storage Technologies (Hitachi GST), the company is breaking through the long-established confines of the category and delivering an external drive that combines highly reliable storage and new levels of data protection with content organization, management, socialization and navigation for both local and online content. • Automatic Organization and Easy Sharing: First drive in the industry that automatically pulls together and organizes your photos, videos, music and documents from your computer, any connected USB device or your social media outlets; making them easier to access, view and share. Easily upload, view and interact with photos on Facebook™, Flickr™ and Picasa Web Albums™ without leaving the app. • Stunning 3D Navigation: The only external drive that effortlessly displays all your favorite memories on a 3D wall so you no longer need to dig through folders and files to find them. • Backup Redefined: Hitachi LifeStudio drives take data protection to the next level, offering both local and online cloud backup in one integrated solution, within one interface – no more downloading and installing two separate programs. All online content is stored in its natural format, so files are available from any Internet browser anywhere in the world, and even from an iPhone® and iPad®. • Access to Favorite Premium Content: For the first time within an external drive, users can search, filter, watch or subscribe to millions of titles from online content providers. Catch the latest news, TV shows and music videos, or even play online games all from within the LifeStudio app. The LifeStudio family, offered in both portable and desktop models, creates an unprecedented solution that seamlessly pulls in, organizes and protects consumers' priceless stored digital content – photos, videos, music and documents – and unifies them with online digital content from social networks such as Facebook and photo sites such as Flickr and Picasa Web Albums. These important digital memories are laid out on a stunning 3D visual wall, instead of in random and hard-to-find files and folders, creating a comprehensive and organized catalog of the user's digital life. Redefining backup, consumers receive the benefits of both local and cloud backup within one single application, making it easy to view, download, and share protected cloud content from any web browser, anywhere. "Our LifeStudio drive starts where others stop," said Mike Williams, vice president and general manager, Branded Business for Hitachi GST. "These drives aren't just about interfaces and capacity, or backup. While these elements are important in an external storage solution, the value comes in creating lifestyle solutions that become part of the way we organize and relive digital memories. Our LifeStudio solution connects consumers to their online and local content in a more intimate way than ever before. For the first time, consumers truly have an integrated experience – one solution to find, view, protect and relive their digital memories. This is a huge milestone for our category." "Personal storage solutions have become an integral part of a consumer's digital life in terms of providing simple storage and backup," says Liz Conner, senior research analyst at IDC. "Pushing these boundaries, Hitachi's new LifeStudio drive brings an innovative approach to the market, addressing how consumers organize, navigate and relive digital memories, seamlessly across multiple digital devices and online sites. Coupled with Hitachi's local and cloud backup strategy, end users truly have an all-in-one solution to help manage their digital life." Today it's not just early adopters using external drives to store and protect their digital lives - it's a huge segment of the population that are deeply connected to the content they create, collect and share. Hitachi research has shown that organization is one of the most frustrating components of a consumer's digital life. Often hectic lifestyles lead to a lack of time spent organizing the growing amount of digital content received daily. What's left is a random storage process, which multiplies a user's frustration when trying to backup, share, find and relieve memories. Additionally, much of what consumers' value from a content perspective is online and socialized on dozens or hundreds of sites. Hitachi is cleaning up the "digital mess" with the LifeStudio family of drives because, in the end, it's about content – protecting it, reliving it and sharing it. After a quick install of the software, the drive's innovative technology instantly kicks in. Your content – photos, videos, music and documents stored on your computer, any connected USB storage device or online sites such as Facebook, Flickr and Picasa Web Albums – automatically begins to appear in chronological order on your stunning 3D wall. Music is organized by artist or album. Now all of your most precious digital content is easily available at your finger tips. No more searching through files and folders. Revolutionizing the way consumers protect their content, the Hitachi LifeStudio drive is the first to provide local and online cloud backup integrated into one single solution, within one install process. The LifeStudio application gives users multiple ways to easily protect their digital content on site or in the cloud. Every customer receives 3GB of online storage for free and for more storage there is an option to upgrade to a quarter of a terabyte (250GB) for only $49 per year, which includes multiple computer protection. Hitachi Backup™ is simple and easy-to-use with default options that cover virtually every Mac™ or PC™ users' backup needs. When using Hitachi's cloud service, all content is stored in its natural format (no proprietary formatting), so files are protected and easy to view, download and share from any web browser, anywhere, even from an iPhone® and iPad®. Backup runs every 30 minutes or can be scheduled at one's convenience. Hitachi understands the need to fit into consumers' fast-paced, increasingly digital lifestyles. The LifeStudio products move beyond a hard drive in a box, into a category all their own. The patent-pending design of the LifeStudio Plus family provides the ultimate in flexibility with an integrated 4GB USB key, which provides a quick way to sync important files and folders for grab n' go ease. With the LifeStudio Plus family, the drive's content management software conveniently allows you to select specific files or folders to sync to the USB key. As a result, users can simply remove the key and take what they need, while leaving the rest of their content safely stored at home. On return, the key docks on the drive to automatically sync everything back together. Designed for both Mac and PC users, the LifeStudio USB 2.0 external drive family comes in both mobile and desktop solutions. Each comes preloaded with the Hitachi LifeStudio content management app and Hitachi Backup software. 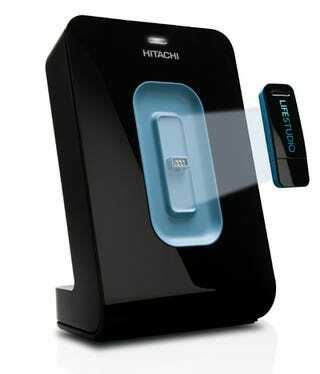 Hitachi LifeStudio external drives will be available at retail and online stores in mid-July.